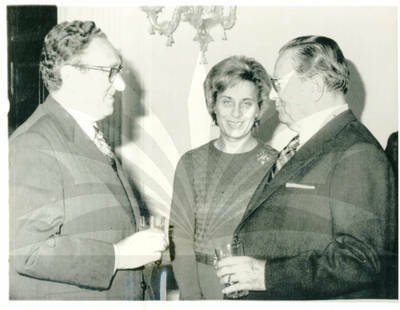 "Henry Kissinger With Yugoslavian President Josip Broz Tito"
U.S. Secretary of State Henry Kissinger chats with Yugoslavian President Josip Broz Tito during former's visit her Nov. 4th. At center is an unidentified interpreter. Black and White Photograph, 7" x 9"